Rooney asked the audience, “What’s fake—and what is something you don’t like?” She went on to share, “You are picking and choosing what you want to believe. That’s intentional [on the part of the news]. The vast majority of stories on Facebook and Instagram are not real.” She gave examples of recent “fake” news and shared historical examples. Rooney advised students to “consider original sources” when evaluating news stories in an effort to determine accuracy. The focus of this year’s symposium was a topic that resonated with students, “especially because it was so current and relevant,” as senior Jack Donnelley mentioned, while fostering dialogue between students and industry professionals. Symposium Co-Chairs Dr. Reese and Mrs. Dolan shared, "One of the main goals of the day is to broaden students’ horizons and to help them to better understand their world. When asked what she learned from a workshop on music and culture in the ‘60s, sophomore Sarah Dean said, 'He showed us how music was used to influence political movements, and I didn’t know about that before.' As faculty chairs of the symposium it is great to see the goals of this endowed program met year after year in a fun way that brings real life experiences into our Brimmer classrooms." Head of School Judy Guild, Kennie Bissell Grogan, Keynote speaker Emily Rooney, Jeffrey Grogan, and Director of Development Elizabeth Smith. Bissell Grogan Humanities Symposium Co-Chairs Donald Reese and Megan Dolan. Head of School Judy Guild. 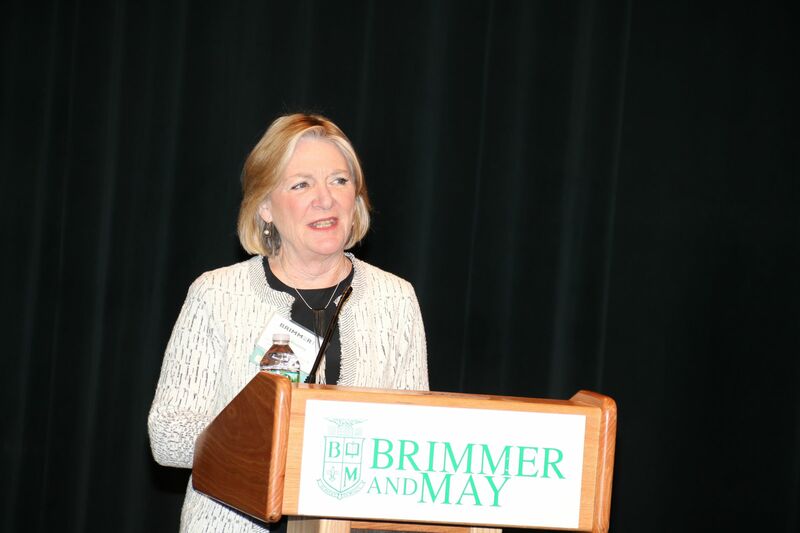 Vicki Donlan ’69: My Journey from Brimmer and May to Newspaper Publisher. John Wihbey: State of the News in the Current Factual Recession. Shelagh Braley: Reporting on Business Outside of the Monoculture. David Cutler ’02: How to Spot Fake News and Where to Go for Reliable Information. Cortney Tunis: Making Our Own News: Women, Stories, and Social Media. Dr. Alex Ludwig: Talking the Blues, Singing the News: How Pop Music Shapes the Media Environment. Tully Nicholas: How the PR Industry Shapes the News. Peter Howe: Just Say No to #fakenews by Making Yourself #realsmart. Michelle Levinger '19: Student Journalism and New Technology. Joe Dwinell: Reinventing Journalism through Web/Print Integration at the Boston Herald. Allan Ryan: Freedom of Speech as It Relates to the Media.